Cavechat.org • View topic - Nerds Rejoice! 'Underground' the Comic Book! Attention comic book nerds: Image Comics is publishing a 5-run series by an all-star team from Portland OR about the most terrifying subject to ever keep cavers awake at night... uh, cave politics? 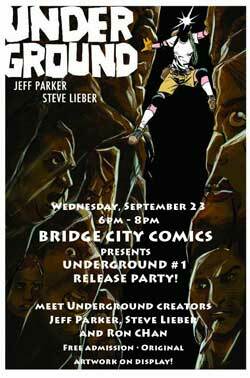 The first issue of Underground will be in stores Sept. 23, 2009; try not to track cave mud into the comic shop. More info at www.undergroundthecomic.com, including a B&W preview of issue 1. Disclaimer: I am not a comic book nerd... anymore. Re: Nerds Rejoice! 'Underground' the Comic Book! hey that's kinda cool. I'll buy them. I have a huge comic collection at home. driggs wrote: The first issue of Underground will be in stores Sept. 23, 2009; try not to track cave mud into the comic shop. ....and just what's wrong with cave mud? Thanks for that info Dave....I'll be sure and get every issue!